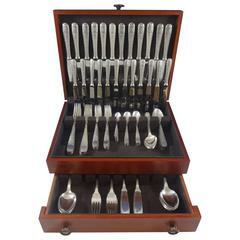 Set of 12 Perles pattern silver plate lobster picks by Christofle, Paris. The are glossy with a beaded edge. It comes with the original box although sadly it is not in good condition. According to Christofle: "The Louis XVI-style Perles pattern was created in 1876. The alignment of beads in halfrelief is typical of Louis XVI ornamentation. This Classic and feminine design outlines the contours of the flatware like a pearl necklace." Stamped on each piece with Christofle mark. Box is in poor condition.